The art of science is most evident when one manages to accurately assert truths about a given fact with little information provided. A great scientists knows how to properly churn information, turn it over a million sides and correlate it with other related facts to form a clear picture. It’s incredible for instance how astronomers are able to image a whole galaxy or even map the universe only by observing light or radio waves – this astonishes me every time. Maybe not as spectacular, but nevertheless worthy of praise for their investigation, paleontologists claim that the large dinosaurs that once roamed the grate planes of the ancient world used to travel for great distances, basing their assumption on nothing more than the information provided by tooth analysis. 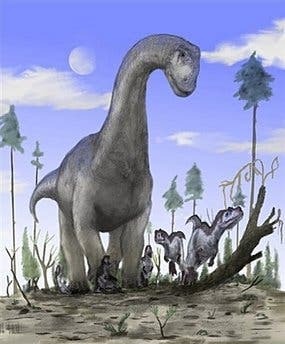 Simply by analyzing 32 fossilized teeth belonging to two sub-species of the Camarasaurus, excavated from Wyoming and Utah, the researchers were able to tell that these giant sauropods used to embark on long and arduous journeys, some 300 kilometers in any given direction. These giant beasts could grow as large 20 meters in length and 18 tonnes in weight, which caused the food supplies to rapidly deplete around them, and in term required them to migrate far and long in search for other supplies. “The question of how sauropods got to be so big is one that is still being actively studied. There’s evidence that some of the reason is that they didn’t have the dental morphology to chew their food, so in order to get enough energy their guts got bigger, and they did more processing in their stomachs,” said Henry Fricke, head of geology at Colorado College in Colorado Springs, who led the study. The team of researchers were able to reconstruct the dinosaurs’ migration patterns by analyzing the oxygen isotopes found in the fossilized teeth. Oxygen isotopes found in the water they consumed was incorporated in layers of enamel as their teeth developed, however the isotopes are different depending on the water source. The researchers found 2 distinct discrepancies in the oxygen isotopes levels, which they compared with ancient soil samples from their lowland habitats and bordering uplands. Fricke and his team were thus able to piece together the facts and conclude the sauropods used to migrate for several months each year, in a seasonally fashion. Most of the dinosaurs were pushed to the limit by this extremely long journey, with many not surviving the trip back home. “What was up in the highlands food-wise we don’t know, the land is weathered away, but the conditions may not have been as hot and dry, and it may even have rained more continuously at the higher elevations,” Fricke said. “This is a neat example of how we can bring geochemical methods to bear on an issue, how we can learn something about dinosaur behaviour that we can’t learn from looking at the morphology of the fossils themselves,” he added.